The following steps are for installing F/X CAD 2019 on a computer that already has Land F/X installed. F/X CAD is our Autodesk approved AutoCAD engine for Land F/X users. More information about F/X CAD. Your Land F/X Support ID*. Your Serial Number and Product Key*. *You or your office will have received your Support ID, Serial Number, and Product Key in an email from Land F/X. The current location of your LandFX folder, as well as where you plan to store it. What is the LandFX folder? Locate your existing LandFX folder. As an AutoCAD installation, F/X CAD requires a robust computer in order to function properly. Take a look at our system requirements. Installing in an office that uses Land F/X on a central server or shared folder and has multiple users? If so, you'll need to install F/X CAD 2019 locally on each individual workstation. Do not install F/X CAD on your server or network share. Installing on a Mac? You'll need to install virtual software such as Parallels or VMware Fusion and a Windows operating system first. AutoCAD or F/X CAD 2019 installed on your computer – even a trial version. Check for and uninstall existing versions of AutoCAD or F/X CAD 2019. A previous version of Land F/X Workstation on your computer. Check for and uninstall Land F/X Workstation. Important: Do not uninstall the F/X Server component – only F/X Workstation. As part of our licensing agreement with Autodesk, F/X CAD requires a licensed installation of Land F/X. If you do not have a Land F/X license, you will be unable to use F/X CAD until you obtain one. Installing as a trial? We are only able to offer a 30-day trial for F/X CAD. We are unable to offer extensions. For F/X CAD to function properly, you'll need to have Land F/X installed. Have you already installed Land F/X? Yes: Move on to Step 3. 3A. Right-click the F/X CAD 2019 Installer download link below. Select "Save Target As" or "Save Link As" from the menu that opens, and save the file to your desktop. The installer is quite a large piece of software. Please allow 10 to 30 minutes for the download to complete. 3B. Go to your desktop, and double-click the file fxcad2019.64.2. If you clicked the download link directly, this file will likely be in your Downloads folder. At this point, you might see the following message: Do you want to allow this app from an unknown publisher to make changes to your PC? A shared online location using a service such as Dropbox. 4A. (Multi-User) Click Install when prompted. 4B. (Multi-User) Select I Accept to accept the agreement. The F/X CAD 2019 option is checked. The Land F/X Workstation option is unchecked. Once you've verified that you have Multi-User Land F/X, click Install. Make absolute sure that you have Multi-User Land F/X installed. If you have Single-User Land F/X, you should be following Step 4 for Single-User Land F/X . F/X CAD will now begin to install. Please allow between 5 and 20 minutes for the installation to complete. 4D. (Multi-User) Follow our steps to map a letter drive for Land F/X. 4E. (Multi-User) Right-click the Workstation Installer (Setup64.exe) download link below. Select "Save Target As" or "Save Link As" from the menu that appears, and save the file to your desktop. The installer is quite a large piece of software. Please allow 5 to 10 minutes for the download to complete. 4F. (Multi-User) Find the setup64.exe file you just downloaded, and drag it into your LandFX folder, replacing the existing one. 4G. (Multi-User) Double-click the setup64 file in your LandFX folder. 4H. (Multi-User) You'll now be brought to the Land F/X Workstation installer. 4i. (Multi-User) License Agreement: Scroll down and select Accept if you agree. Because you're using F/X CAD with Multi-User Land F/X, you'll need to point it to your LandFX folder on your shared mapped letter drive. Click Browse. Browse to and select your LandFX folder, then click Next. Important: It is absolutely crucial to navigate to the correct location of your LandFX folder during this step. What is the LandFX folder? Don't know the location of your LandFX folder? Click the Can't locate your LandFX folder? button. Please allow a few minutes for the installation to complete. You can now move on to Step 5: Open F/X CAD and get started. Don't see Land F/X anywhere? Is there no Launch Land F-X shortcut on your desktop? Solution: Navigate to your LandFX folder and run (double-click) the setup64/setup.exe file. Use these steps if you have Land F/X installed on a single computer and aren't using an office server or shared online folder. 4A. (Single-User) Click Install when prompted. 4B. (Single-User) Select I Accept to accept the agreement. 4C. (Single-User) Verify that both items are checked. Once you've verified that you have Single-User Land F/X, click Install. Make absolute sure that you have Single-User Land F/X installed. If you have Multi-User Land F/X, you should be following Step 4 for Multi-User installations. 4D. 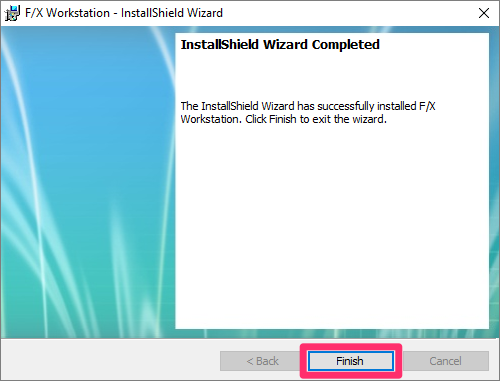 (Single-User) You'll now be brought to the Land F/X Workstation installer. 4E. (Single-User) License Agreement: Scroll down and select Accept if you agree. Because you're using F/X CAD with Single-User Land F/X, the default location, C:\LandFX, is correct in most cases. If this location is correct, click Next. Otherwise, click Browse and navigate to your LandFX folder. Important: It is absolutely crucial to select the correct location of your LandFX folder during this step. What is the LandFX folder? Solution: Navigate to your LandFX folder – it will most likely be at the location C:/LandFX – and run (double-click) the setup64/setup.exe file. You should see the Autodesk Licensing screen, pictured to the right. Click I agree to agree to the privacy statement. Then proceed to our steps to activate F/X CAD 2019. • Issue: Error message: This product is not registered. Please reactivate it by typing REACTIVATE. Solution: Reactivate your installation, then restart F/X CAD. • Issue: When you open F/X CAD, do you not see your Land F/X ribbons, tools, or menus? 1. Load the Land F/X menus manually. 2. Still don't see your Land F/X ribbons, tools, or menus? Get the latest Land FX ribbons. • Issue: Don't see Land F/X anywhere? Is there no Launch Land F-X shortcut on your desktop? Solution: Navigate to the C:/LandFX folder (or the location where your LandFX folder is stored) and run (double-click) the file setup64. • Issue: You received an error message similar to the following: Unable to establish an Internet connection to the registration server to validate your Support ID. Solution: You may need to disable a firewall on your computer before you can license our software. For F/X CAD to function correctly, it's a good idea to uninstall all previous versions of AutoCAD or F/X CAD from your computer – after you migrate your personal settings from that version. 6A. Follow our instructions to migrate your AutoCAD or F/X CAD settings. 6B. Open your Start menu, and select Control Panel. 6C. Select Programs, or Programs and Services. Then select Add or Remove Program. 6D. Double-click the logo for your existing AutoCAD or F/X CAD installation. When the file opens, select Uninstall. Follow the prompts to uninstall the program. For more detailed steps, see our Uninstall AutoCAD or F/X CAD page. Ready to see F/X CAD 2019 in action? Watch our brief Power Tip video on What's new with F/X CAD 2019. View our in-depth webinar on F/X CAD 2019. We also have an extensive Learning Resources section covering everything you need to know about our software, with resources ranging from instructional articles to short Power Tip videos, in-depth webinars, and more. Go to our Learning Resources page. See our documentation on customizing your F/X CAD interface. Check out our recommendations for configuring F/X CAD.